Cate Crowley took this year’s students traveling to Bolivia to a new school for the deaf, Centro Effeta Inclusión. The school is directed by Paula Pao Pastor, who was previously director at Camino, another school for the deaf in La Paz. This year’s TC grad students were there just in time for Día de los Madres (Mother’s Day) in Bolivia. 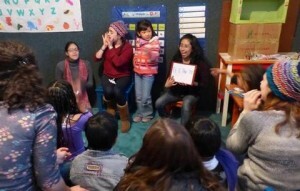 TC students provided speech and language therapy in Spanish alongside other teachers and professionals working at the center. Since Centro Effeta is a school for the deaf, much of the therapy occurs in individual or group sessions performing hearing evaluations, fitting and adjusting hearing aids and aural habilitation for students with hearing aids to acquire spoken language. However, students were also able to push into classrooms and support learning and access to the curriculum in that setting as well. 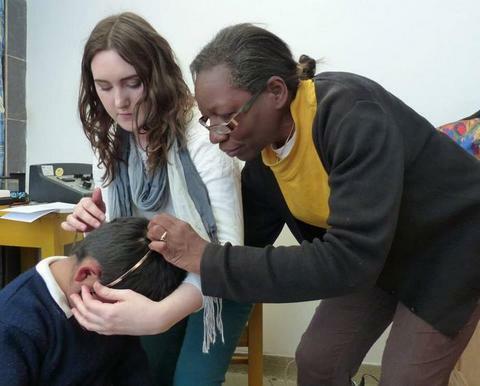 Melissa Innis was there as the audiologist to supervise fitting and cleaning of hearing aids for children at Effeta. Check out the pictures below to get a better idea of the student clinicians’ experiences! 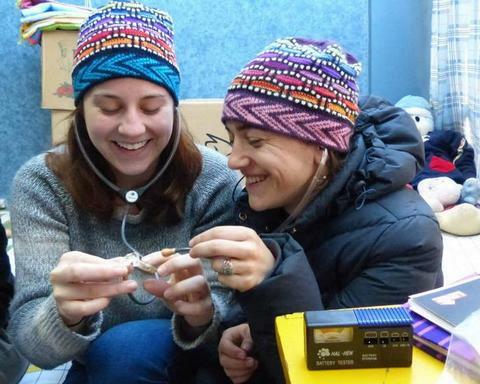 Cate Duffy and Melissa Innis perform hearing screenings at the Centro Effeta Inclusion school for the deaf in La Paz, Bolivia. Here we can see the bone conduction portion of the hearing screening. 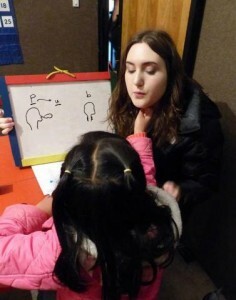 A student from Teachers College teaches a student with hearing impairment how to perceive the difference between P and B at the Centro Effeta Inclusión School for the Deaf in La Paz, Bolivia. Teachers College students worked with students with hearing impairments at the Centro Effeta Inclusión School for the Deaf in La Paz, Bolivia. Students collaborated at all levels of idenfication and treatment of hearing impairment, including hearing screening, hearing aid fitting and cleaning. Students complete push-in therapy in a classroom with students with speech and language impairment at Centro Effeta Inclusión in La Paz, Bolivia.